Food Recovery Network (FRN) started 2018 by making history with our largest one-day food recovery to date: 27,655 pounds of food. Fifty volunteers recovered 68 pallets of products from the Specialty Food Association 2018 Winter Fancy Food Show in San Francisco, which was donated to the Delancey Street Foundation, a nonprofit residential self-help organization. Specialty Food Association (SFA), a membership-based trade association that represents specialty food retailers, entrepreneurs, and distributors, hosts a Fancy Food Show every summer in New York City and winter in San Francisco. During these events, SFA members have the opportunity to showcase their latest and greatest food products to buyers and competition alike. Buyers include those purchasing for markets, large and small, throughout the country. Thousands of vendors fill aisles with an array of food products from around the world including everything from flavored chocolates, artisanal cheeses and handmade pastas, to olive oils, coconut waters, and small batch salsas. The entrance into the Moscone Center, South Hall, as the 2018 Winter Fancy Food Show is in full swing. FRN is proud to have verified both the Summer and Winter Fancy Food Shows through our Food Recovery Verified program. When FRN verifies an event, we ensure that surplus food is donated to a local nonprofit organization. Food Recovery Verification is a way for businesses and events to show — to their employees and customers — that they are taking positive steps to divert food waste from landfills. The Fancy Food Shows are paving the way for other events by recovering their food and gaining recognition for doing so by becoming Food Recovery Verified. 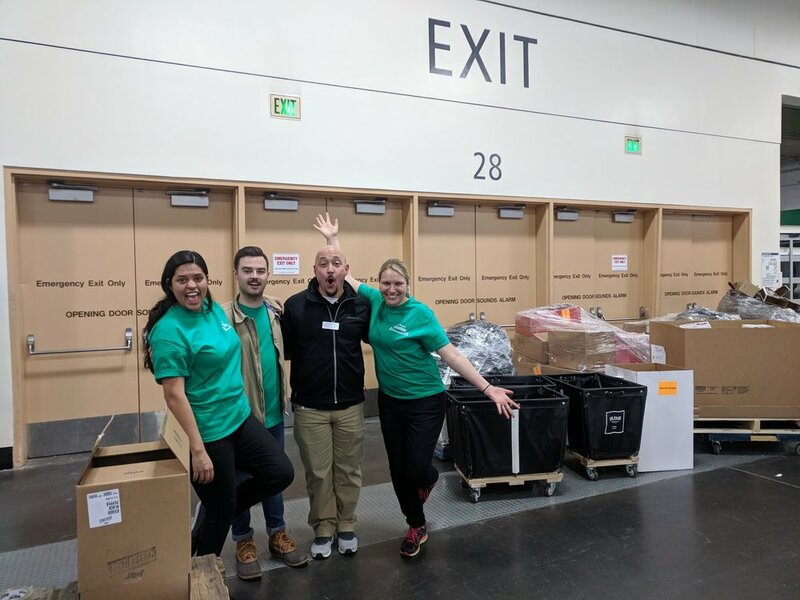 On January 23, volunteers gathered at the Moscone Center, a conference center in downtown San Francisco that is so large that its two buildings are connected by a tunnel underneath Howard Street. Volunteers were trained by FRN national staff on how to do a recovery from a trade show. At four p.m., the Winter Fancy Food Show ended, and the recovery commenced. Among the organized chaos of the show being torn down, volunteers used rolling bins to scoot up and down aisles collecting food labeled “perishable” and “non-perishable” prioritizing perishable items to keep within food safety regulations. The event spanned across three massive halls. With good running shoes and lots of energy, volunteers navigated the aisles of their designated halls, some the size of a football field. After collecting donated food, the items were organized in consolidation zones, placed onto pallets and shrink wrapped. Every pallet that was wrapped inspired feelings of accomplishment among volunteers and staff because the incredible food was going to the Delancey Street Foundation. The Delancey Street Foundation, a residential organization that supports individuals through job training and other reentry programs, was the primary partner agency and nonprofit recipient for this recovery; 27,655 pounds was donated to its culinary training program. Delancey supports individuals who are recovering from alcohol and/or substance abuse or those who are reintegrating into society after being incarcerated. Part of this support includes job programs that teach and employ individuals in truck driving, restaurant work, and other vocational occupations. It was very rewarding to find a partner agency that could not only accept the entire food donation, but that contributed to the recovery’s success and was so gracious in the process. “We feed over 250 residents three meals a day and they are in heaven to be able to eat tasty, healthy, fresh food,” Stephanie said. To organize and execute this recovery, FRN brought together individuals from across the FRN Bay Area community, which included dedicated students, alumni, and professionals. Makena Wong, co-founder of the Santa Clara University chapter and now alumna, was so dedicated to making this project a success that she brought along a group of colleagues from her company’s San Francisco office. Evan Ponchick, one of the founding members of the flagship FRN chapter at the University of Maryland, now lives in San Francisco and was able to join the crew of volunteers. Nearly seven years ago, he volunteered at the first-ever FRN food recovery; it was truly momentous that he was able to partake in FRN’s largest-ever recovery in San Francisco this January. The food recovery movement is gaining momentum every day from the work that FRN is doing across the country. Students at more than 235 FRN chapters recover food from their campuses while Food Recovery Verified businesses build food recovery into their daily operations. By organizing a recovery from the 2018 Winter Fancy Food Show, FRN helped this event set the precedent for similar events of this scale. Across the country, food recovery can —and should— be the norm in our schools, our businesses, and at our events. Pallet by pallet and pound by pound, it is possible to fight waste and feed people in every community. Older PostFRN at the 2018 Food Rescue Summit: Where Will the Movement Go From Here?